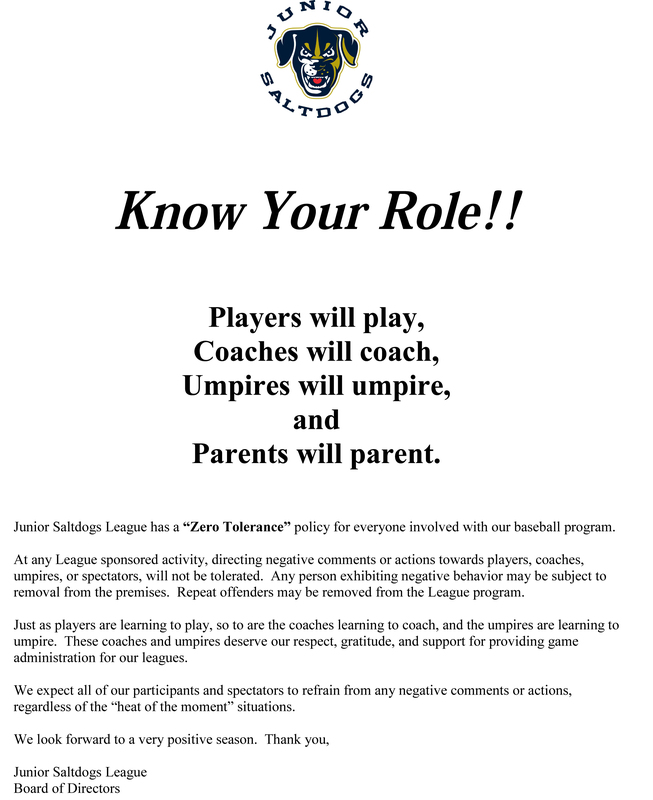 Junior Saltdogs League has a “zero tolerance” policy for everyone involved with our baseball program. Click here for more. Click here for Junior Saltdogs bat rules. U6-U14 divisions: Registration for our 2019 season is closed. We are not accepting additional players for these divisions (no exceptions). If you would like to be added to our database to receive registration information when it goes out for our 2020 season, please email your player’s name and mailing address and a parent’s email address to Deb at jslregistrations@jrsaltdogs.com. U16 (high school) division only: The second registration period for the U16 division will open later this week – please check back for details. TEAM ROSTERS….U6-U14 head coaches have received their team rosters. Coaches will make first contact with all of their players. If you have not received a contact from a coach by Thur evening, April 18th, please check your spam/junk folder first and then email Deb at jslregistrations@jrsaltdogs.com with the player’s name and division and she will put you in touch with your coach. U16 coaches will receive their rosters in very late May and will reach out to their players after that. GAME SCHEDULES…U6-U14 schedules will be final and given out to coaches on April 27. Shortly after, we will link them on each division page of our website for parents to download. The U16 schedule will be linked on the U16 page in early June. KNOW YOUR ROLE…Players will play, coaches will coach, umpires will umpire, and parents will parent. Jr Saltdogs has a “zero tolerance” policy for everyone involved in our program. We ask that every parent, coach, and player in our program read the flyer about this on our website (posted in box in top right corner and on the Coach Information page) as well as read the Code of Conduct page. Please help us to have a positive season! TEAM SHIRTS…U6-U14 coaches will receive team shirts on April 27 and are asked to hand them out right away. Because all the shirts are customized with a sponsor logo and player number on the back, there are no extras. It takes about 5-7 business days for the printer to receive a shirt and print it so please have your child try on their shirt right away when he receives it so you know it fits. Re-ordered shirts are $20 and must be ordered through us. If one is needed, email Deb at jslregistrations@jrsaltdogs.com with the following information: player’s name, division, team name, the # on the back of the original shirt (the new shirt must have the same #), and the best phone number for the printer to reach you (parent) at when the shirt is ready for payment/pick up at the printer. After the dates above, bat checks will be very limited during the season. Please don’t count on them being done at the fields during game nights. Games will not be delayed for bat checks so if it’s important to your child that he use his own bat for his very first at bat, please be sure to have the bat check done at one of these pre-season bat dates. used in a game. Just a reminder that bat checks are not needed for U6 and U8, and since high school bat rules apply for U16, we will check all U16 bats at a later time. TEXT ALERTS…Be sure to sign up to receive our text alerts for game rainouts or additional information. Text JRSALTDOGS to shortcode 84483 from the phone you want to register. It will immediately send a text back to you to confirm that you are now registered or it will confirm that you are already registered. If you don’t get this, go to the Rainout Info page of our website for some troubleshooting tips. PHOTO DATES FOR PLAYERS AND COACHES…Photos will be taken on the dates below. Composite photos are used for the team photo. Parents will have the option of receiving photos electronically or mailed to their home. Sun, May 26 from 12noon-4:30pm at Haymarket Park (NOTE: The Lincoln Saltdogs will host the Junior Saltdogs Player’s Clinic for our U6-U14 divisions from 3:00-4:00pm. There is a Saltdogs game at 5:05pm – use your Saltdogs fundraiser ticket vouchers and stay for the game). Coaches will receive photo packets to distribute to all their players. Extra packets will be available at Haymarket Park on photo days. LINCOLN SALTDOGS’ WATCHDOGS PROGRAM…The Lincoln Saltdogs would love to have Junior Saltdogs teams participate in their Watchdogs Program. Watch for the flyer to be linked soon or contact the Lincoln Saltdogs directly at 402/474-2255. JSL PLAYER’S CLINIC WITH THE LINCOLN SALTDOGS…The Lincoln Saltdogs will host a free player’s clinic for all JSL players on Sunday, May 26th. Watch here for the flyer with all the details. If any questions, contact Bret Beer with the Lincoln Saltdogs at 402/474-2255. NO REFUNDS: The JSL has a “no refunds” policy so before registering your child, please be sure their plans are final. If you plan to list a coach or friend request, please be in touch with them to confirm their plans before registering your child. QUESTIONS: Most questions can be answered by first referring to our FAQ page. Or if a question still remains, please email Deb at jslregistrations@jrsaltdogs.com. Sign up for Text Alerts from Junior Saltdogs. Click here to sign up.